Sometimes we just need a simple reminder. The world pulls our attention in a gazillion different directions. Everything wants our attention. Like, have you ever been to one of those markets aimed at tourists? Every single vendor is clamoring out at you, wanting your attention. Some of them will go to crazy means to get you to look at them: jump in front of you, flirt, get mad, etc. The things in your life are a lot like that. It’s all calling for your attention. Holding you back. Slowing you down. So, there is one thing that we MUST do. Sometimes what I have to say and what I learn on here is complicated and intricate. It takes time and lots of words to explain, but today… I want to just focus in on this one thing. Just this one verse for today. I know that you have read it and seen it a million times, but I just want you to say it to yourself over and over and over and over again today. Sometimes… sometimes we just need a reminder that it’s true. We need to remember that we are not weak. In Him, YOU are strong. In Him, YOU are good. In Him, YOU are completely and totally capable. In Him, YOU can do ev.er.y.thing. Because HE gives you strength. I don’t. want. to write. this post. I want to be asleep in my bed. Snoozing and skinny. I want to be free from this struggle with food. I want to forget chocolate. forget sugar. forget bread. forget food. I want to do just what I hear God calling me to do. Because it means that I have GOT to start facing up to some things. I’ve been eating chocolate. sugar. meat. bread. Lots of it over the past few days. Not just a bite here and there. Not a taster. Not a respectful tiny bite to appease someone else who is feeding me. No. LOTS AND LOTS of chocolate. Anywhere and everywhere I could find it. Sometimes I’d put it off for a few hours, but then I’d give in. The leftover Christmas candy in the gift closet. The remaining chocolate chips in the pantry. The kid’s candy stash. The cake at Nanny’s. The Cool Whip in the fridge drizzled in Hershey’s syrup. The homemade granola bars I made for my son’s lunches. Me. Eating. Eating. Eating. Eating. And I have this hole in my soul. And every bite stretches it wider and wider. Until now I feel like I’m about to burst. And so, as I laid in bed tonight… I couldn’t sleep. I mean, who CAN sleep with a huge black hole of sin growing in your chest? God. What am I doing?!?!? Why can’t I stop?!?!? I’m choking with sin. The sin of gluttony. The sin of dishonoring You. The sin of harming this beautiful temple that you have given me. The sin of wanting to sin instead of wanting to obey and follow you. Oh God, Oh God, Oh God, who will save me from this? God, I cannot save myself… I cannot heal myself. It must be YOU that does this work in my life. Just as you raised Lazarus out of the grave… out of the pit… raise me out of this pit of sin. out of this grave of deathly living. out of the sludge of denying you. I’m not even sure what to do from here. where to go. what to think. how to act. what to read. So God, I just lay my sinful soul at your feet. An offering. An incomplete, sinful filthy offering… but one that is covered in righteousness because of your Son. It is a sacrificial offering. And I am the sacrifice. Do what you want with me God. Change me. Ruin me. Build me up. Recreate me. Heal me. Save me. My praises are for you alone! then I realize how much I still have to learn. This is why we need to be around our elders. We’ll live better lives if we listen to their wisdom. It’s like they give us the fast track to happiness. If we listen to them, more often than not, we get to skip over the mistakes and the hardship. And this particular lesson is: prayer. And how many times have I learned this lesson? I dunno… lots. My husband’s grandmother gave me a book when he and I got married called The Power of a Praying Wife. I ignored it for a year or two. I prayed… sometimes. When I prayed… I asked for what I wanted. what I thought was best. what I had figured out would be good for me. Yeah… I got a lot of what I prayed for… and it wasn’t necessarily a good thing. Then, I read through that book… not even sure why, but it totally changed my perspective on a bunch of things. Like, I stopped praying specifics about what I wanted God to change about my husband, and I started praying only that God would give my husband wisdom and that He would continue to make my husband more and more like Him. Yeah… that worked a lot better than the self-centered blech I was praying before. And yeah… I’m having myself a little bit of a revival about prayer right now. Only this time it’s not about my husband, but just about me. I have always been the type to pray continually… just when something pops into my head I pray about it. I also used to journal my prayers a lot (at least I did before I had kids… since I had my first son five years ago, I fall asleep three or four lines in)! But lately, there has been almost no prayer… no conversation… going from me to God. And honestly, I think I have been blocking out what He’s been trying to say to me. Yesterday’s post was really the first time that I had really talked to Him. And I find myself almost having to retrain myself with how to pray. or with being comfortable with praying. or with “making” myself take the time to stop and pray. or all of those. You see, I think that what I did for a while is that I was replacing prayer with the reciting of scripture. Now, reciting scripture to myself has gotten me through a bazillion temptations… but I think what happened is that slowly I started to lose my connection with the One that said the scriptures in the first place! It was almost as if instead of relying upon God and God’s power to save me, I was relying upon the Bible… almost in a worship-the-wrong-thing kind of way. But part of this whole thing is a learning process. And it takes times of “failure” and a following of introspection. And it’s kind of nice that an “oops” is sufficient. Because after the “oops” comes action (like I talked about here). The action is prayer… reconnecting with the Spirit of God. reconnecting with His Power. reconnecting with His Love. His Grace. His Hope. Lately as I have been meeting and talking with people that are doing the Covenant several people have mentioned that they are amazed at my vast knowledge of bible verses. Well, I bumped a post that I had planned for today back a few days in order to reveal my big secret. It could take me thirty minutes to find “the” verse I’m looking for. And if I can’t find one then often I find that means I need to look back into my post to make sure what I am saying is biblical! Now, it does help to memorize a particularly helpful verse once you have found it… like, I say that one “make me willing to obey” all the time, but I came across it on accident while looking for a verse with a specific topic and THEN I memorized it. 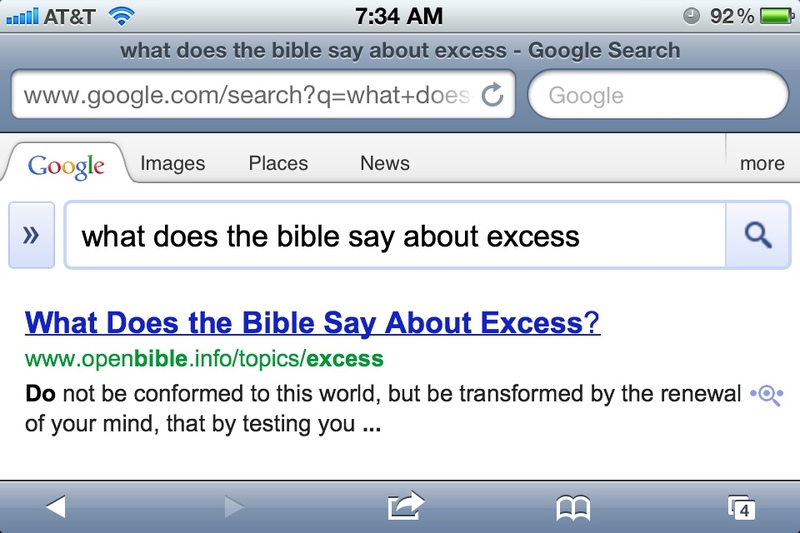 So, although I might appear to have a vast knowledge of the bible, I don’t. But I do have something that is better… I hunger and thirst for righteousness. And that is a verse that I used to pray a lot starting when I was in college… I wanted to hunger and thirst for righteousness, and now… at 33… I have finally found that desire. And I have found that my hunger and thirst for righteousness is filled when I read my bible and when I reference my bible in my thoughts. But, as far as me being some kind of spiritual paragon and master of all things biblical. Ha… no, I’m definitely not all that.